As mentioned in the Tool Wheel section, the middle ring allows you to adjust the active brush’s size (how big it is), opacity (how transparent it is), and smoothing (how bumpy or smooth you want your line to appear once it’s drawn. Tap on one of these options to bring up your presets. To access the Brushes menu, tap again on an active tool, or double-tap on an inactive tool. 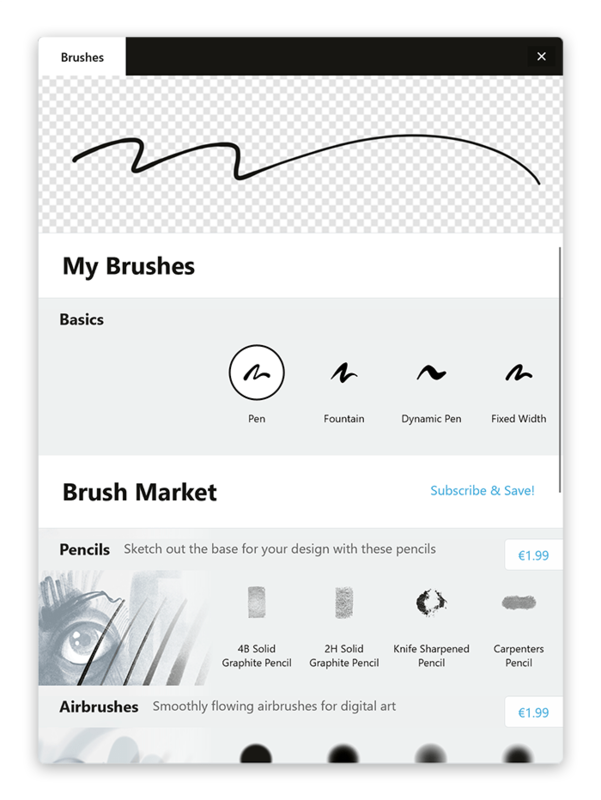 In the Brushes menu, you can select a tool from the basic set of sketching tools or from the brush market. Up at the top of the menu is your brush viewer, which changes to preview the brush you choose. Below the viewer you can find your basic tools, where you can select from a variety of organic or engineering brushes. 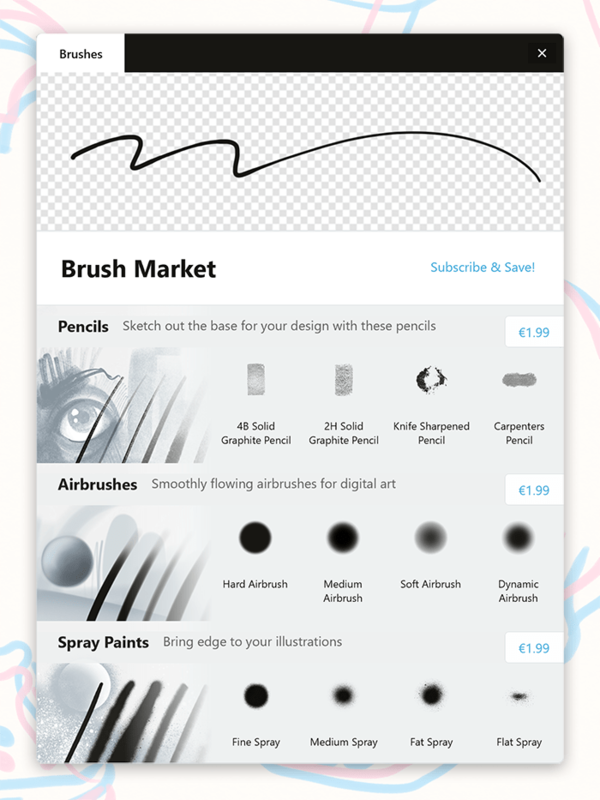 Scroll down further and you’ll find the Brush Market, with different types of artistic brush libraries that you can unlock a-la-carte, or enjoy open access to if you’ve subscribed. "Positive space" refers to any area inside your drawn line between start and end point that is original to the stroke - as in, the area hasn’t been drawn over a second time during the same stroke. This crossing over of filled area causes it to become “negative space” and remain empty. Of course, if you draw over the area a third time within the same stroke, it becomes positive again and is filled. Troubleshooting. Since Fill takes into account the start and end points of your line, make sure Line Smoothing is set below 100%. Otherwise your shape will disappear into a line or a point as though the rest of the stroke never happened. Also check that your transparency is above 0%, or like all strokes it may disappear, only to be found when Selecting in the area. In a traditional pixel-based world, erasers delete things permanently. But vectors aren’t pixels, they behave and remember data differently, and if you're comfortable with programs like Adobe Photoshop or Autodesk Sketchbook Pro, it may be easier to think of the Concepts eraser as a masking tool. It visually removes anything underneath it like a lovely soft eraser, but the data isn't actually gone. You can still retrieve old strokes later, or adjust your mask as your drawings progress. The eraser stays the same size regardless of your zoom level. This means the further you zoom inward, the smaller its effects will be - very useful for working with the details. You can also change the size of the eraser using the Size slider, and its effects will scale the same way. Whether you want to showcase your work to your client or just pan through your infinite canvas, you can use the Pan tool. It allows you to pan and zoom without accidentally selecting or changing anything in your drawing. The texture-rich, artistic tools in the brush market are made from image-based stamps created from their actual physical counterparts. Strokes made with these brushes (as well as the Dynamic Pen) are movable and adjustable like all of our other vector-based tools, but they are limited when it comes to zoom. As they are made from pixel-based images, they will pixellate if you zoom in too far, depending on the brush. Try them out and see which ones you like best, or try changing the look of existing drawings by selecting your strokes and switching to a new tool.